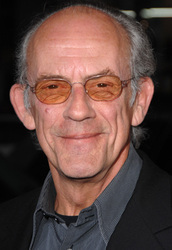 Christopher Allen Lloyd is an American actor. He is best known for playing Doc Brown in the Back to the Future trilogy, Uncle Fester in The Addams Family films, and Judge Doom in Who Framed Roger Rabbit. He played Reverend Jim Ignatowski in the television series Taxi and most recently Mr. Goodman in Piranha 3D. He also starred in the short-lived television series Deadly Games, and also was a regular in the short-lived TV series Stacked, in the mid-2000s.